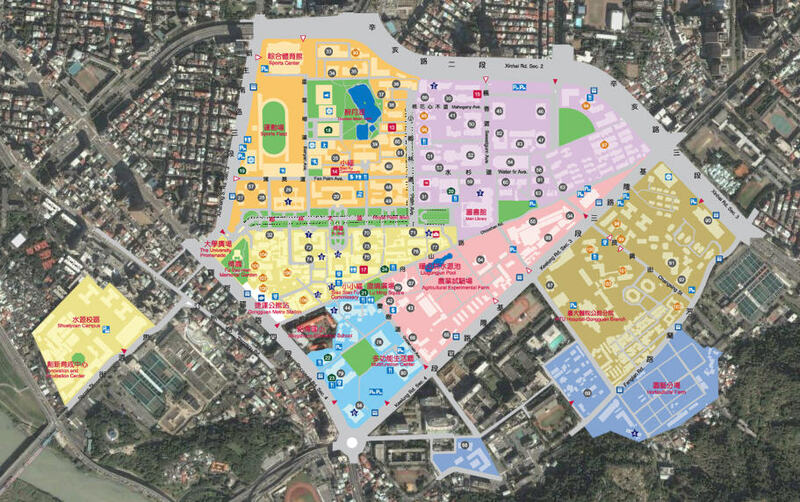 General Campus Tours are traditional graphical display on the main plane at National Taiwan University campus years ago had also vrml showed three-dimensional manner, but because there is no entity such as the background, such as satellite images of the match, then disappeared. Two years ago, the emergence of Google Earth, I can think of Google Earth as a platform to make the campus map, but personal technological capacity is limited, only on paper, looked at the past two years, the evolution of GE application, Google Sketchup is also the beginning of this year the Office of the United States 3-D campus of the University of competition (Build Your Campus in 3D for Google Earth Contest), I could have the whole of Taipei 3-D buildings are completed, which of course include NTU campus, but it was limited to-face (not to affix Building Facade photographs) show, If we were to build a veneer of 3-D buildings, no groups of volume is impossible. As expected, Google recently announced the winners of the seven universities, almost all from construction-related faculties by the United Effort obtained. Although not my personal capacity will be posted each building face, but I can also think of another way to make the campus map, I use the campus map overlaying maps in Google Earth fooled base map, marking each building name (if it can also can be added by the Web site of links, this part of the barbaric time to be added), before I get with the Campus 3-D structures, if users are familiar with GE’s manipulation interface, which is actually great campus Map way!Recently, I saw the Singapore market will be built in F1 GE top (Singapore F1 Race Visualization in Google Earth), of which there are trees on both sides of the car, tall, carefully read this, the original photo is the modeling methods used today Take king coconut trees to make it, the most famous is the National Taiwan University small Ye-lin Road, a day after never be too, since this time to modeling, on the calculations carefully, the Ye-lin Road, a 102 south, the north is 99, small Ye-lin Road east have 63, 68 west, and the map on both sides of the former egg shape sod 17 each, a total of 366 , I will be king of coconut trees on these actual location completed and planned two kinds Ye-lin Road fly tabled path, a road map for those, for another landmark Map, in this download NTU campus Map kmz file , a National Taiwan University campus tour to it ! This entry was posted in GE 3D, GE 4D, NTU Campus and tagged 3d, 4d, sketchup, 台北, 台大, 導覽, 立體. Bookmark the permalink.